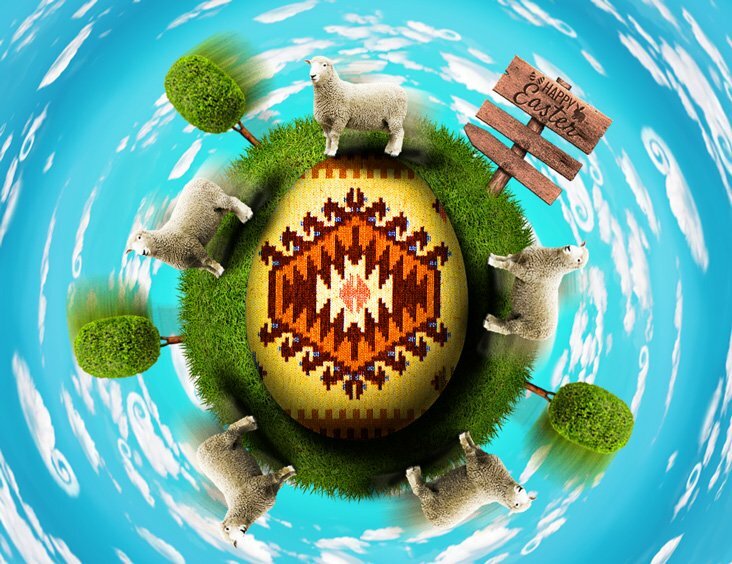 Learn how to create a Easter grass planet in Photoshop from this new tutorial for beginners. You can create your own micro planet in just a few steps. Create customized Happy Easter greeting cards for friends and family. Add the Seamless Clouds Background in a new layer. You can use this image as Photoshop clouds pattern. Add the White Egg PNG in a new layer above the Clouds Background layer. Place the Grass Planet PNG image behind the White Egg. Press Control-T to resize the grass sphere to obtain an elliptical shape. Add this layer style to the White Egg layer. Depending on your canvas size, you might have to adjust the layer style settings. Add this Folk Cross-stitch Seamless Texture in a new layer above the white egg. Set the blend mode to Multiply. Use the Eraser Tool to delete the part that exceeds the egg shape. Go to Edit > Transform > Warp and select Arch to bend the texture. Add a Levels adjustment just for the Cross-stitch Texture; righ click and choose Create Clipping Mask. Add the Cartoon Tree PNG in a new layer. Add the Wooden Sign PNG in a new layer. Use the Eraser Tool to delete the area that is in the grassto create a realistic effect. Copy the daisy flower image and delete the black background. Add multiple copies of the Daisy Flower in the grass. Use the Transform Tool to scale the flowers on vertical scale to make them look as realistic as possible. Add a soft Drop Shadow layer style. I also added some flowers that are falling from the grass planet. Use the Filter > Blur > Motion Blur to create the motion effect. I suggest you use a copy of the Daisy Flower layer for this effect with a lower opacity level. You can add other elements like birds, more trees, maybe sheeps, etc. I will add some bees flying. Use these Realistic Vector Bees to add as many bees as you want. Don't forget to add a Drop Shadow layer style. Make sure the shadow is only visible on the grass planet surface and not in the air. You can use the Filter > Blur > Motion Blur to create the motion effect. I suggest you use a copy of the Bee layer for this effect with a lower opacity level. To create the sunlight effect, add a Gradient adjustment layer. The colors for the radial gradient are: #ffffff (opacity 100%, location 0%), #ffde26 (location 33%) and #ffde26 (opacity 0%, location 100%). Set the blend mode of this adjustment to Screen. Use this Sunlight Rays Texture in a new layer and set the blend mode to Screen to create the sun effect. 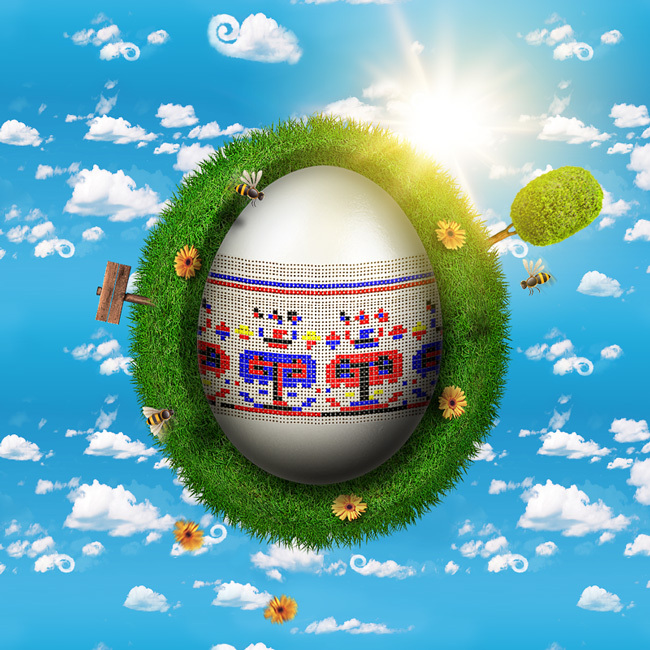 So here is the final result for our cute Easter grass planet made in Photoshop using only free PNG stock images, textures and some basic layer styles. 4 comment(s) for "Create a Cute Easter Grass Planet in Photoshop"
When I saw these at Textures4PS, I wondered what you would do with them! LOL You did awesome things! Hi Su, I am so happy that you like our new Easter tutorial.